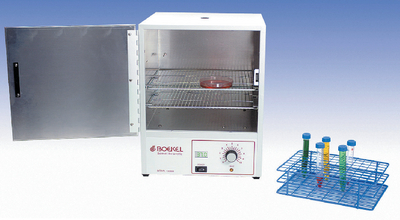 For culture kits, microplates, petri dishes and test tubes, this incubator features an acrylic plastic door with magnetic latch, pilot light, one integral bottom shelf, and one adjustable shelf. Maximum temperature: 60°C. Volume: 23.8L. 115V. Size: 13"W x 14"D x 16 1/4"H.